Vermont Mandatory Consumer Information Disclosure – Click for PDF version of Disclosure form. This site is set up to give you comprehensive information about real estate in the Stowe, Vermont area. Whether you are a buyer looking for homes, condos, land or commerical property or a seller who wants to know what the competition is, you can find that data here. My hope is that you will find the MLS Town Search and MLS Map Search to be invaluable. Also, there is a lot of local information about Lamoille County Schools and Washington County Schools. Great Local Links is also loaded with popular searches such as the Stowe Reporter, the VT Dept. of Motor Vehicles, and the Movie Schedule. If you want to see what is new on the market in the Stowe area, go to the “Just Listed” button. All homes that have been listed within the past 7 days located in Stowe, Morristown, Waterbury, Hyde Park, Elmore, Johnson, Wolcott and Eden will be shown. You may also search for condos and townhomes by project name by clicking on the MLS Condo Search button. Wildewood is a year-round residential experience set in nature and located within minutes of Stowe Mountain Resort. 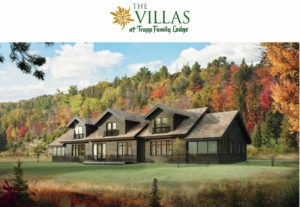 “A little of Austria…a lot of Vermont” – These condos feature 2 bedrooms, 2.5 bathrooms, plus loft villas and access to all of the Trapp amenities and activities you and family enjoy. 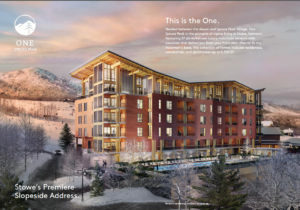 ONE SPRUCE PEAK – New Development at Spruce Peak in Stowe – February 2019 listed by Spruce Peak Real Estate. Nestled between the slopes and Spruce Peak Village, One Spruce Peak with the pinnacle of alpine living in Stowe, Vermont. 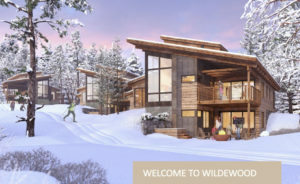 Featuring 27 ski-in/ski-out luxury mountain retreats with elevators that deliver you from your front door directly to the mountain’s base, this collection of homes includes residences, townhomes, and penthouses up to 5,000 SF. Contact me for more information about these exciting additions to Stowe. Of course, I’d love to be able to help you whether you want to buy or sell or know anyone who does. Thank you for visiting! Besides Real Estate, I also enjoy taking photos around the Stowe, Vermont area. I think Vermont is such a beautiful State. Since I drive around a lot, especially on the back roads, I have the opportunity to see so many breathtaking settings. I usually have my camera on me and attempt to take photos that show all those special places and various lighting. Feel free to visit my photo site at www.StowePhotos.com I hope you enjoy them as much as I enjoy taking them!